"I'm afraid you've been found guilty of murder," said the lawyer, "and the bad news is that you're getting the electric chair. However..."
His client raised his eyes hopefully. "The good news," continued his lawyer, "is that I got the voltage lowered." 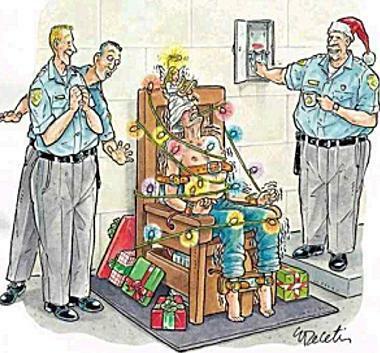 A prisoner in the electric chair got a sudden case of the hiccups. He looked up the warden who was just about to pull the lever. "Could you, hic, do something to hic scare me please?"